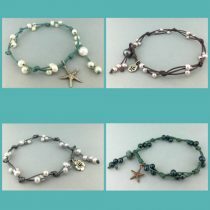 Join us in this class to learn how to make a leather and pearl anklet that will enhance your summer outfits. They are fun and flirty to wear, but easy to make. We have an awesome selection of stunning pearls to chose from. You will also receive a copy of the instructions with your class fee.